Atlas. 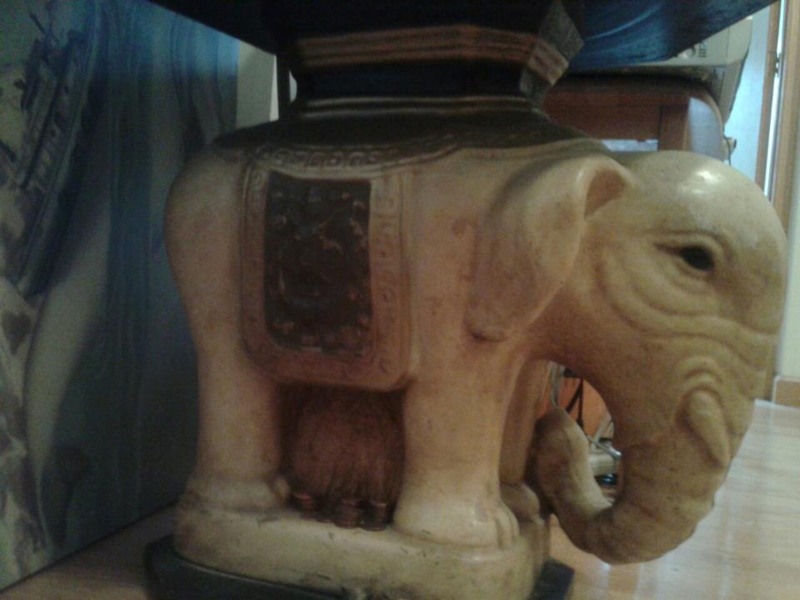 You can call him an end table but he is pure elephant to me. A year and a half ago I dreamed of elephants. These were no ordinary elephants, mind you. These elephants were splendid and formidable, with glittering gold blankets and ornaments. They dazzled so brightly they hurt my eyes. They were marching in a parade through downtown Manhattan. And after frantically trying to call and text people to come admire them, only I alone could see them. Elephants symbolize the removal of obstacles. I know if I see one, I am in the right place. It could be a statue of Ganesha, an elephant trumpeting on a book cover or embroidered on a pillow, a small figurine in a shop window, or a hood ornament dangling from a taxi driver’s rearview mirror. And when I see one, I press forward. One elephant stays with me. His name is Atlas. Over the years as an end table, he has held up books, a lamp, stacks of papers and manuscripts, even a microwave. He has been with me steadfastly since my sophomore year at Yale.